Blog Quick Quotes: Quick Quotes and Want2Scrap with Dana! Quick Quotes and Want2Scrap with Dana! We are so excited to partner with our friends at Want2Scrap all this month! Be sure to visit each of our blogs for fabulous inspiration and of course... prizes! Hi Quick Quotes fans! 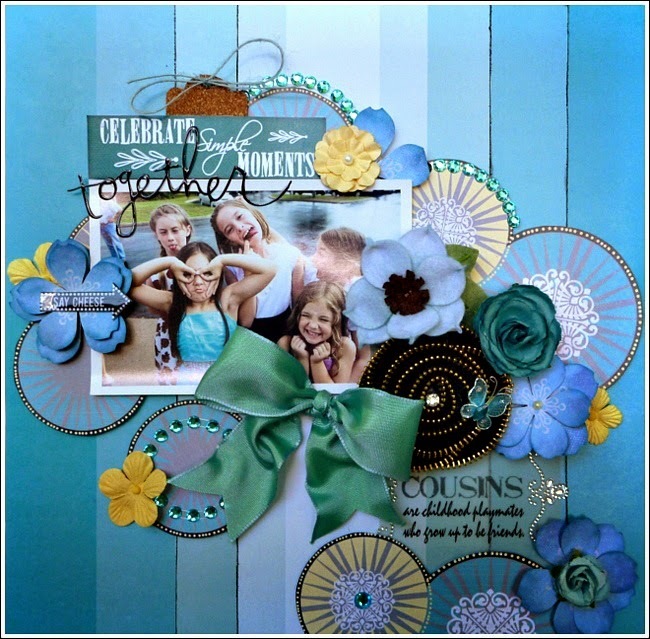 Dana here today sharing a layout that I created with the new Dream Big collection and Want2Scrap Bling! We recently attended a family wedding and my daughters were absolutely thrilled to spend time with their cousins. We all enjoyed a weekend of non-stop laughs! I built up a layered background on this page. I cut two stripes from a piece Dream Big 400 patterned paper, lightly distressed and inked the edges with Midnight Confessions PowderPuff Chalking Ink and then layered them over the corresponding stripe on another piece of Dream Big 400 patterned paper. I then cut circles from a piece of Dream Big 100 patterned paper and adhered them over the stripes with foam mounting tape for some fun dimension. I found the perfect vellum quote in the Babies, Kids, Family Itty Bitty Quote Box. I framed the sentiment with Want2Scrap Fancy That! Beautiful Bling Borders. I used several Want2Scrap Nestabling Petite Scalloped Circle Small Turquoise Rhinestones to highlight the circles that I cut from patterned paper. I filled in my flower clusters with hand cut and layered blooms and topped one with a Want2Scrap Turquoise Butterfly. Bling highlight on the circles really draws the eye into the images/content. Great design! What a gorgeous layout, Dana!! The layers of papers are gorgeous!! Love this technique.